This is a documentary about an amazing human being. 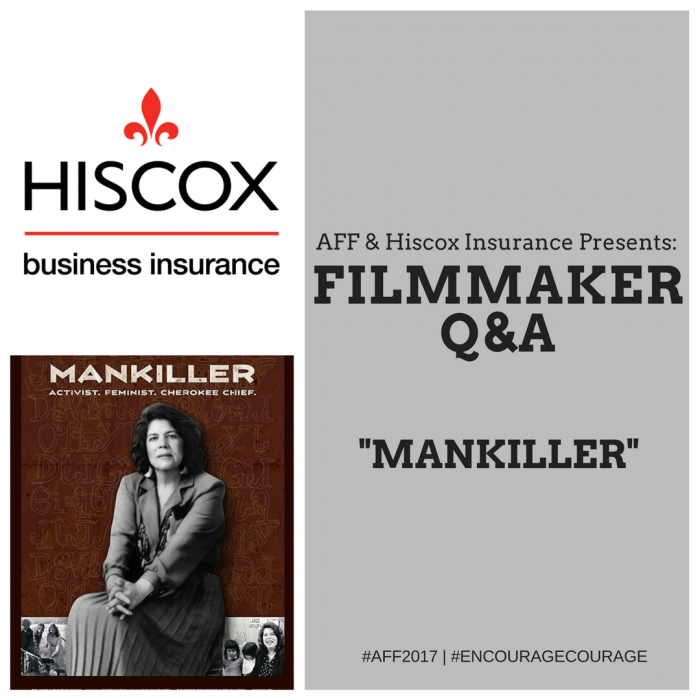 MANKILLER is the powerful story of Wilma Mankiller, who found her voice in San Francisco’s civil rights movement and returned to lead the Cherokee Nation as the first woman to be elected Principal Chief. The fact that she achieved more positive changes for the Nation than any other leader before or after, is merely icing on the cake of her story. She overcame numerous obstacles including rampant sexism and racism but never wavered. Her life story is so much more than a biography it is truly an example of grace, poise, dignity, humility and success despite adversity—the true meaning of servant leadership. After Wilma passed away in 2010, her widower (Charlie Soap) and friend Kristina Kiehl decided to make a narrative indie feature film about one chapter in her life and leadership…when this came to our attention, my contact at Vision Maker Media (for PBS) and I put our heads together and felt there also needed to be a non-fiction documentary about Wilma’s life. But I was also very humbled and concerned that I might not be able to do Wilma’s story justice; then once I knew Executive Producer Gale Anne Hurd would join me again (for our third project) I couldn’t wait to produce and direct this, as we work so well together. (FYI as I’m sure you know, Gale Anne Hurd is one of entertainment industry’s most esteemed producers of Academy and Emmy Award-winning programs. She is currently an Executive Producer on THE WALKING DEAD, which reigns as the most watched scripted cable drama, as well as the AMC companion series, FEAR THE WALKING DEAD.) But we both knew we couldn’t make this film without the support of Wilma’s family so when they also came on board together with our fantastic production team, we really knew we had an amazing opportunity for collaboration. As a Native American woman of Cherokee heritage, I have been a fan of Wilma Mankiller’s for many, many years and was obviously drawn to the story of a strong woman role model. Then as we delved deep into the Research & Development phase I realized how much more there was to Wilma’s story and was drawn to her legacy as a truly positive example that our current leaders need to see and understand. Although I had no idea when we started this project in 2011 that the world would evolve to such a sad place of divisiveness and negativity in politics, it truly seems as if Wilma’s message is being seen and heard through this film at a time when her voice is sorely needed. As I mentioned above, I have been a fan of Wilma Mankiller’s my entire adult life. However, once I started researching and really delving into who she was and her background it was almost eerie how many similarities there are between our lives. Her father was full blood Cherokee (as was mine) – her mother is 100% Caucasian (as was mine). Her family was relocated to San Francisco on the BIA program as was my father (I was born near SF because of this). Wilma never used labels but was a uniter – I hate labels and try to also be a uniter. These are just a few – but the connection I feel is uncanny. Gale and I seem to always be drawn to stories that do not take place in a current modern day timeframe and whose subjects have passed on, so therefore require us to locate historical archival footage and photos. (Our prior two docs were based in WWII and WWI respectively). The war footage was actually easier to access than MANKILLER’s since there are national archives for the military. The core of Wilma’s story takes place in the 60’s, 70’s and 80’s and although those decades were not that long ago, they are light years in the past technologically. We scoured family, friends’ and co-workers’ materials as well as the Cherokee Nation, universities, news agencies (local and national) and a variety of organizations worldwide. We received some materials on VHS and cassette tapes. We have appearances from Gloria Steinem, Bill Clinton, Congressman Tom Cole as well as local Cherokee community members. We shot additional interviews and footage five or six times over four years to try to get everything in the film. Creatively we were committed to have the story to be told from Wilma’s point of view and voice and to capture that we had to compile all the available footage of her speaking as well as home movies and eye-witness testimonies from those who loved and worked with her. It was a daunting task and what really changed as we delved deeper and deeper into her life were the amount of items we wanted to use and the budget for licensing. It was a daunting task on our budget and in the end we have over 700 individual pieces of photos and footage that had to be cleared and licensed—which was not initially anticipated! We absolutely decided that this film was to be told from Wilma’s POV and using her voice. In her autobiography she made it very clear that no story should ever be about her alone, she always wanted the Cherokee history and culture highlighted as well. She also wanted to be a role model to empower women of all types and therefore saw herself as a humble part of a much larger story. In trying to honor her wishes we had to really frame the story with this in mind and had to keep going back to the question of how to balance her voice and story with a larger viewpoint of the Cherokee history and women’s issues and movement and always strike that balance. Wilma was an elected leader for three terms and therefore a political figure. Anytime a film deals with politics I feel the filmmakers take a risk in that the film should not take a political position or be a political film and yet there are political topics discussed by default. I felt this particular risk was in that we might be misunderstood as trying to take a political position when we are merely messengers as filmmakers…we interviewed so many people that served with her or were a large part of her life while in office and I really felt my role was to represent the whole picture without any bias and yet still have her voice shine through. The variety of archival footage and photos really determined the visual style. We had a treatment with the various chapters of Wilma’s life but then within those divisions, the materials we were able to source really set that section’s style. For example the “San Francisco in the 1960’s” section (where she grew up) is really visually exciting because we were able to draw from so much material like the Black Panther’s and the Alcatraz take over and even Rock N’ Roll! I gravitated to documentary filmmaking because I saw a need to tell stories that might otherwise be unheard or unseen and I feel drawn to focus on underserved communities and topics. If a filmmaker really has a passion to tell a story – then you really can’t stop and you must tell it. When that passion hits, in my experience, you get that film made no matter what. Now in the industry it is great how many resources are available and how much support can be garnered so I encourage all filmmakers with that special passion to go for it. But I will add that it is very difficult with long hours, extreme dedication required and a lack of monetary reward – so it really takes unique personalities. If a filmmaker is making a film for any other reason than the passion to tell a story that needs to be seen…than they perhaps need to rethink things! See A Conversation with Gale Anne Hurd then catch Mankiller – purchase your badge today!